The Global Volcanism Program has no activity reports for Huanquihue Group. The Global Volcanism Program has no Weekly Reports available for Huanquihue Group. The Global Volcanism Program has no Bulletin Reports available for Huanquihue Group. A group of young basaltic volcanoes lies in Argentina near the Chilean border, south of Lanín volcano. The Huanquihué volcano group consists of a NNE-SSW-trending chain of stratovolcanoes of Pleistocene age, some of which lie along the border. A Holocene compound cinder cone with three nested craters up to 400 m in diameter that occupied a valley NE of Cerro Huanquihué and a tuff cone constructed within glacial Lake Epulafquen lies at the northern end of the chain. Growth of this Holocene tuff cone, La Angostura ("The Narrowing"), created a peninsula that formed a narrow channel connecting Lake Epulafquen and Lake Huechulafquen. A very recent lava flow from the base of the Achín-Niellu cinder cone (also known as Cerro Escorial) traveled north into glacial Lago Epulafquen, forming a prominent lava delta. The Escorial lava flow is an extremely youthful flow that diverted local drainages and formed new lakes. A radiocarbon date of about 200 years before present was obtained from this flow, and local residents recount oral histories of the eruption, which was observed by their grandparents. Inbar M, Risso C, Parica C, 1995. The morphological development of a young lava flow in the south western Andes - Neuquen, Argentina. Zeit Geomorph, 39: 479-487. There is no Deformation History data available for Huanquihue Group. There is no Emissions History data available for Huanquihue Group. 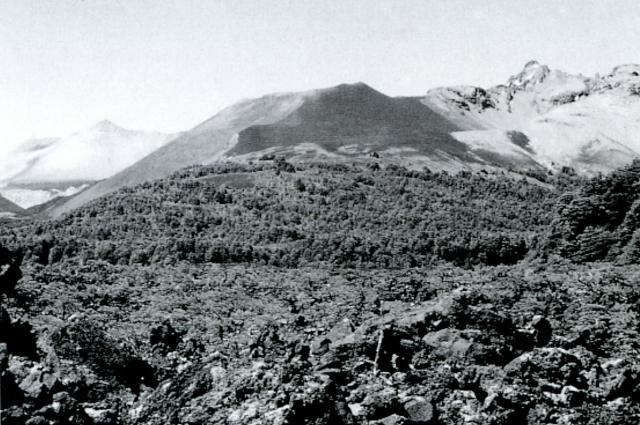 The blocky, partially forested Escorial lava flow in the foreground originated from Achín-Niellu (also known as Achen Niyeu or Cerro Escorial) pyroclastic cone (center). The Escorial lava flow traveled north into glacial Lago Epulafquen, forming a prominent lava delta. Oral accounts of local residents stated that the flow was witnessed by their grandparents, who described the eruption of smoke, ash, and lava that changed the shoreline of the lake. Photo by Moshe Inbar, 1995 (University of Haifa). 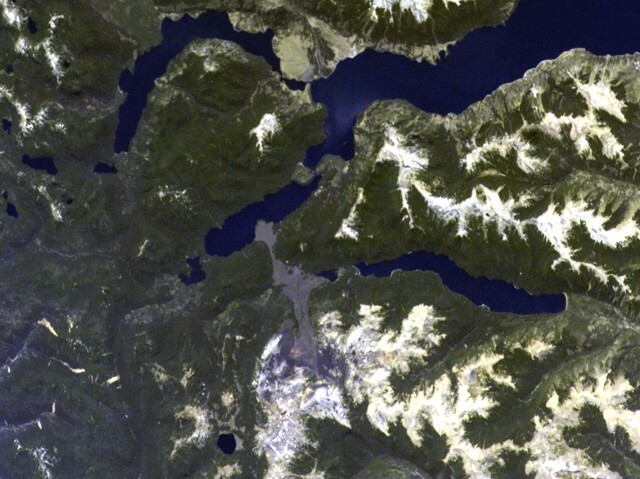 The linear grayish lava flow extending into two lakes at the center originated from the Achín-Niellu cinder cone in the snow-covered area at the bottom-center of this NASA Space Station image with north to the upper left. The distal end of 7.5-km-long flow forms a large delta into Lago Epulafquen. A cinder cone separates this lake (known in the Machupe language as "Two Lakes") from the large lake at the upper right, Lago Huechulafquen. The lake at the right-center is Lago Curruhué. NASA Space Station image ISS004-E-7197, 2002 (http://eol.jsc.nasa.gov/). The blocky, partially forested Escorial lava flow in the foreground is seen from the north on a boat on Lago Epulafguen. 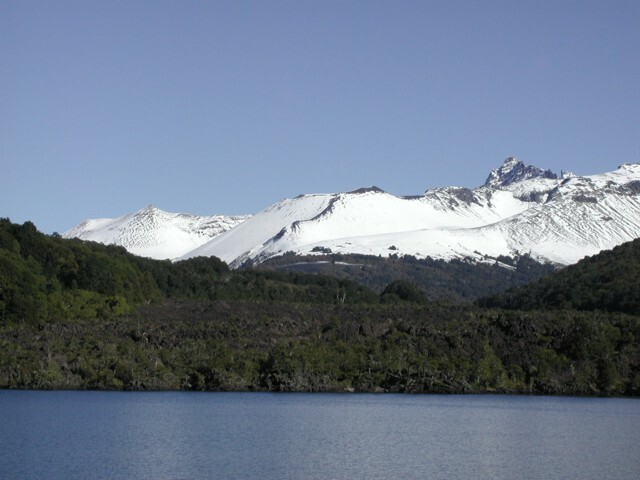 The flow originated from the Achín-Niellu pyroclastic cone (center), which is part of the Huanquihué group of young basaltic volcanoes in Argentina near the Chilean border south of Lanín volcano. The Escorial lava flow was erupted about 200 years ago, and local residents recount oral histories of the eruption, which was observed by their grandparents. Photo by Héctor Osvaldo González, 2007. There are no samples for Huanquihue Group in the Smithsonian's NMNH Department of Mineral Sciences Rock and Ore collection. Large Eruptions of Huanquihue Group Information about large Quaternary eruptions (VEI >= 4) is cataloged in the Large Magnitude Explosive Volcanic Eruptions (LaMEVE) database of the Volcano Global Risk Identification and Analysis Project (VOGRIPA).